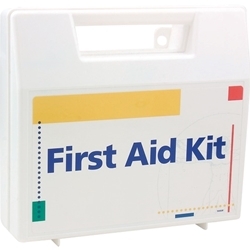 This is the First Aid Kit you always want to have on hand. It has 106 pieces and meets federal OSHA recommendation. It is partitioned, water-resistant, plastic, portable and wall mountable. It even includes 1 pair of gloves and a first aid guide.